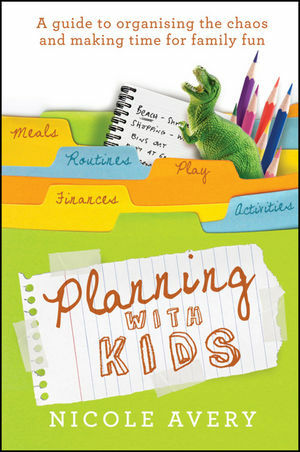 Written by mother of five, Nicole Avery, this book shows harried parents how, with just a bit of planning, family life can become easier to manage, less stressful, and decidedly more fun. "Dream on," you say? "I might as well try to herd cats as to get my kids to follow a lot of arbitrary rules!" And Nicole would agree, which is why Planning with Kids isn't like any other parenting guide out there. It was inspired by Nicole's blog of the same name, which, over the past three years, has garnered a huge audience of likeminded parents who have achieved nothing short of miraculous results following her advice. While other prescriptive guides offer mums and dads cook-cutter solutions to the challenges of raising kids, this handbook focuses on one simple, straightforward idea: by implementing a few simple strategies for how you do things, you'll make more time for you to be you and your kids to be kids. You'll find strategies for streamlining and enhancing everything from the routines of daily life, to family relationships, to budgeting and finances, playtime and much more! Divided into sections so that readers can dip-in and dip-out for information as they need it as their family expands and grows up! Nicole Avery is the master organiser behind popular blog 'Planning with Kids', where she shares tips and tricks to organising the chaos of family life. This is her first book.